This summer has been full of news about Asian carp. Some good and some bad. But the underlying issue hasn’t changed. This invasive species poses a serious and urgent threat to the Great Lakes, and immediate action is needed to prevent them from reaching Lake Michigan. 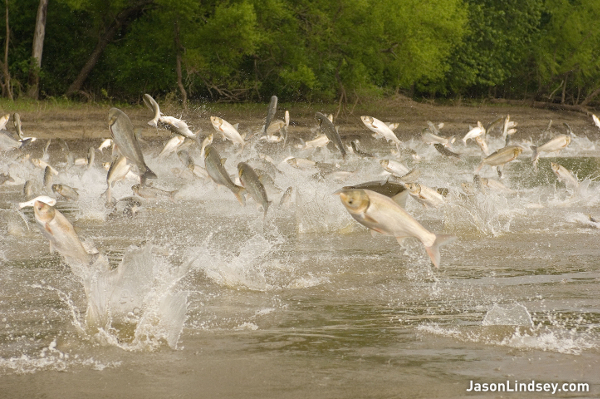 Here’s the rundown on this summer’s Asian carp news and how you can get involved. On June 23, an adult Asian carp was found just 9 miles from Lake Michigan, beyond the existing electric barrier. The finding was disturbing news and highlighted, yet again, the urgent need for action to stop Asian carp and protect the Great Lakes. The catch triggered a two-week period of intense monitoring by federal and state agencies. The news also increased pressure on the Army Corps of Engineers to release a study of additional Asian carp protections at the Brandon Road Lock and Dam near Joliet, IL. The facility is a logical choke point location to install control measures to stop Asian carp from moving closer to the lake. The study had been completed months prior but its release had been blocked by the Trump Administration. After two weeks of monitoring, agencies announced that no additional carp were found past the barriers. Officials appeared to be breathing a sigh of relief in public announcements. But we, and the Great Lakes region, were not. The finding of an adult Asian carp north of the electric barrier should have been a wake-up call. Study after study has offered clear evidence that the existing electric barrier is not a foolproof solution. The research has shown that barges can pull fish through the barrier. Yet, agencies have done little to implement best practices to reduce the risk of Asian carp moving through the electric barrier. And, sure enough, more bad news about Asian carp was released later in the summer. Why Did the Fish Cross the Barrier? In mid-August, the autopsy report of the fish found in June was released to the public. To understand more about the fish, researchers examined the fish’s otolith, essentially a fish ear bone. Otoliths are analogous to tree rings, with markers that provide information to researchers about the waterbodies the fish lived in during its life. The report confirmed that the fish grew up below the existing electric barrier. This alarming news meant that the fish made it past the barrier and underscored the urgent need for additional protections at Brandon Road. Fortunately, the summer did have some good news on Asian carp. Thanks to public pressure from Members of Congress and thousands of Great Lakes residents the US Army Corps of Engineers released the draft Brandon Road Study in mid-August. The draft Brandon Road Study, which was supposed to be released in February, provides a detailed look at the Army Corps’ tentative plan to install protections against Asian carp at the Brandon Road Lock and Dam on the Des Plaines River in Joliet, IL. The U.S. Army Corps of Engineers looked at six options, from taking no action to putting in place a host of technologies and structures to prevent transfer of aquatic invasive species such as Asian carp. The report also does examine the option of closing the locks completely. The Corps’ proposed plan includes building a new lock, as well as other technologies—such as water jets, complex sound, and electric barriers. The Corps’ proposed plan provides near term solutions to the threat of Asian carp in the Great Lakes. But it does not permanently resolve the issue. The plan instead provides a stop gap for more robust preventative efforts in the future. 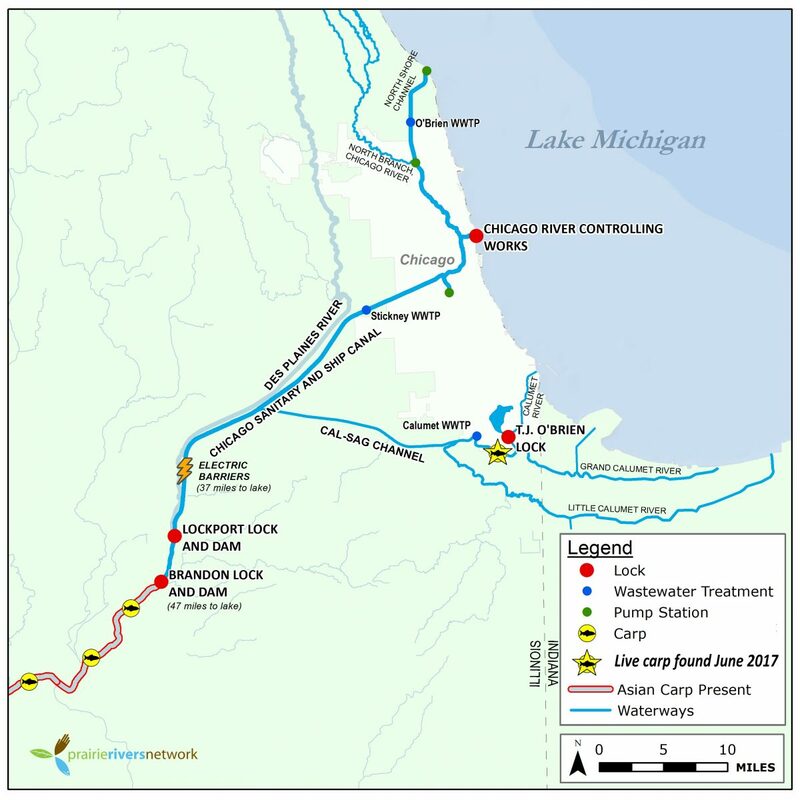 A two-way solution solution is still needed, as the study does not address interbasin transfer both to the Great Lakes from the Mississippi River Basin and vice versa. With all of the bad news about Asian carp this summer, it is critical that all of the solutions on the table in the study – from technology to lock closure – must be examined closely. None of these options, including lock closure, should be removed from consideration. We need everyone who can attend to be there to let the Corps know that urgent action is needed to stop Asian carp. If you can’t attend a meeting in person, the US Army Corps is offering a variety of ways to participate via webinar or social media. This is an urgent problem, and the U.S. Army Corps of Engineers must act immediately to implement protections against Asian carp. The Corps’ plan is not a permanent fix—additional technology is still needed to prevent carp from ever reaching the Great Lakes and the electric barrier must remain on at all times. In the meantime, the threat level of aquatic invasive species must continue to be monitored. New invasive species are likely to emerge in both the Mississippi and Lake Michigan, and the associated risks must be promptly and adequately assessed. A two-way solution is still needed. The U.S. Army Corps of Engineers recently released its draft Brandon Road Study, a detailed look at the Corps’ tentative plan to stop Asian carp. Right now, they're asking for feedback from the public—now is the time to speak up. Tell the U.S. Army Corps of Engineers to take swift, strong action to stop invasive Asian carp.